Just like the sackbut was associated with a good death scene and the afterlife, we thought of the traverso every time we thought of love. This is not too far off from the Baroque period, when the traverso was often used in association with love, birds, and pastoral scenes. Leighann Daihl Ragusa jams in the forest in a leather jacket, as she often does. This is not a staged photo. 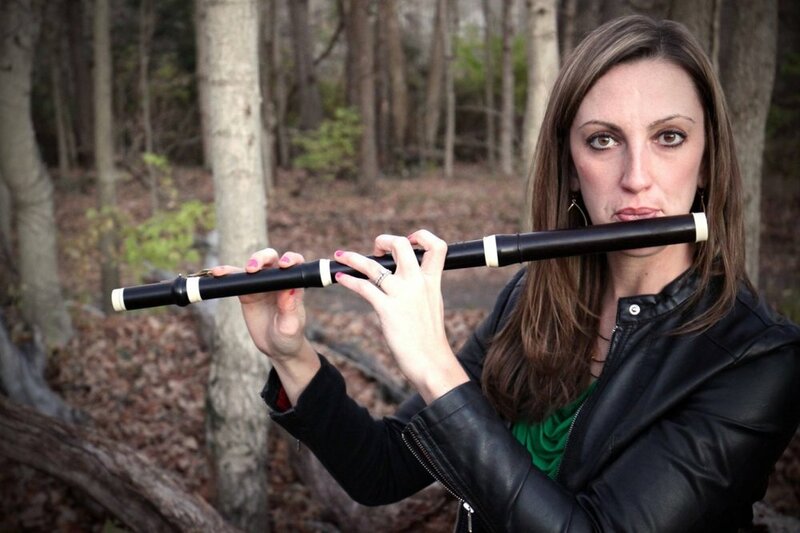 Leighann Daihl Ragusa plays Jacques Morel's Chaconne en trio (1709) with New Comma Baroque. The traverso (or baroque flute) and a modern day flute couldn’t be more different in physical shape and timbre. The traverso has just one key and 6 holes, and is made of conically shaped wood that tapers in shape. The modern flute is all metal, has 28 keys, and does not taper. The difference in shape allows the modern flute to play more evenly throughout the whole range, as opposed to the traverso which has a stark contrast in sound between high notes and low notes. A composer of the traverso knows these issues and picks keys knowing exactly which notes come out stronger and which come out weaker. In a less desirable key, a traverso cannot project or play as loudly as it can in a “good" key. Like a vocalist, the traverso player learns to control their air, and starts (or articulates) tones by producing syllables. One such group of syllables often used is tu-ru, which sounds like it's spelled. This syllable pairing creates little waves, or mini-swells, of sounds in the notes, instead of a harder short staccato sound. There are a few other syllables a traverso player has in the toolbox to use, but the goal remains the same: create contrast between the notes. As with other instrument of the Baroque era, the wavering of the tone - called vibrato - is thought of as an ornament and not a default part of the sound. For the traverso, it is more subtle and not used very often. When it is used, it creates a nice shimmer. Like a good seasoning for (insert favorite food here), it's used sparingly. Fun Fact: A player can also literally shake the flute rock guitar style to get a good vibrato. No whammy bar needed. Rock on. Slash plays traverso. Not Photoshopped at all. Our composers, Heidi and Amos, got to meet with Leighann and simultaneously get acquainted with the traverso. A few discoveries were made: the traverso does an especially good percussive “cha” or “sha” sound which may or may not make it into their compositions. Wilbert Hazelzet!! Other great writers of the traverso include Hotteterre, and of course the masterful J. S. Bach. The J.S. is German for "we are not worthy."